Warsaw. Works by Henryk Berlewi and Edward Hartwig are currently shown in Warsaw, Poland. Artists: Yomar Augusto, Henryk Berlewi, Edward Hartwig, Fontarte, Polex-Expol, Zuo Corp.
Berlegustopol is a temporary company established by the participants of the exhibition. Due to the fact of its creation Piktogram/BLA gallery space will be transformed into a special type of exchange zone, “service-and-trade enterprise”. Explosion of private entrepreneurship that took place immediately after central planning-socialism was deposed in Poland after 1989 resulted in record-breaking increase in the number of new private companies. As much as 600,000 of such private businesses came into existence solely during 1990–1991 period! The whole phenomenon has been accompanied by spontaneous outbursts of creativity: in word generation (names), graphic design (logos), advertisement etc. The title of the exhibition has been influenced by the procedure of company name-creation that utilized agglutinated pieces of names of the co-founders of private companies. Another popular method of name-creation based on adding “-ex” or “-pol” suffixes to fragmented names of business partners, or to words connected to a particular profession. Thus, new words, extraordinary linguistic conglomerates and phonetic units originated. In the title of the exhibition, name fragments of two artists, Henryk Berlewi and Yomar Augusto, have been blended into a whole. Both of them dabbled with the advertising industry. Henryk Berlewi, artist of the first avant-garde, established Reklama-Mechano advertising agency in 1924, that—among its rare realizations—worked on the legendary Plutos chocolate folder. In his theory of “Mechano-facture”, Berlewi wrote: “As regards the creation of new schematic facture-based system, such handicrafted technique [as painting] becomes powerless. And, in a given case, only mechanistic technique based on industrial technical means is able to relieve us in this task … technique dependent upon rigorous and precise function of the machine.” Stressing this modern approach to art-making practice, Berlewi’s first solo exhibition was organized in Austro-Daimler automobile demonstration space in 1924. Yomar Augusto (1977) is a typographer experimenting with calligraphy, bookbinding, screen-printing, as well as with sculptural techniques (wood-carving included) and laser paper cutting. He employs assorted tools of artistic craft, collects and processes old books, maps and postcards. Augusto is interested in layers of information that he unearths in found objects. However, one of his typefaces has decidedly above-the-average attack force: font designed to use on Adidas sportswear for Football World Cup South Africa 2010 became an integral element of the whole advertising campaign during championship. 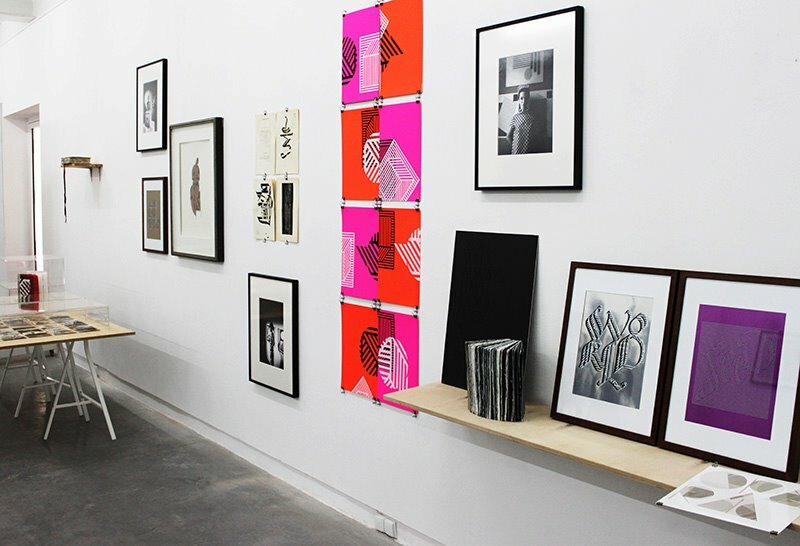 Exhibition line-up also includes Fontarte graphic design studio, whose founders are also authors of retrospective publication on Berlewi, as well as publications on graphic design, e.g. “Typespotting. Warsaw” which explores such subjects as: city information systems, “alternative typography,” neon advertisement lettering designs, and a lettering in architecture. Specially tailored typographic projects by Augusto and Fontarte will spread, among others, on gallery’s “shop-windows,” and on the clothes designed by ZUO Corp., which due to a decision to reduce seams to a minimum, become universal in their prospective usage and typified by their “organic” geometries. Another layer of the show is added by fashion photo shoot organized byEdward Hartwig in 1966 focused on geometrical abstraction. Models wearing elegant attire marked by black-and-white geometrical patterns pose against the exhibition of mechano-facture works of Henryk Berlewi, who also appears in the photographic footage, surrounded by beautiful girls. The title of the exhibition is supplemented by a suffix “-pol”. This is referenced in an archive called Polex-Expol, which consists of a substantial collection of snapshots depicting logos and shop-signs of the companies, the names of which contained “-pol” or “-ex” syllables (sometimes designed by amateurs and produced in a primitive way). Juxtaposition of avant-garde art theory with fashion and advertising industry, functional typography and refined calligraphy with rough non-professional design creates specific field of references for the exhibition which should be posited somewhere between workshop, boutique and wholesale store. *Calligraphy using wood and self-made tools. Producing experimental letters shapes. *”Typo-facture.” Experiments with typography and graphic structures.